I imagine viewers might be expecting to see a tragic tale of lives lost in a futile war, and we’ve had a lot of films like that and some of them are very, very good. But this is another side to this story of the First World War, and I think it’s a particularly British thing that we tend to laugh in adversity and this is about the triumph of the human spirit in adversity. It shows how a group of men managed to survive the First World War, by trying to make as light of it as possible. There are some very subversive jokes, there are some satirical jokes and there are some very silly jokes. It resonates with us a lot and hopefully the audience will be genuinely surprised how this body of men reacted to the horrors of the First World War. 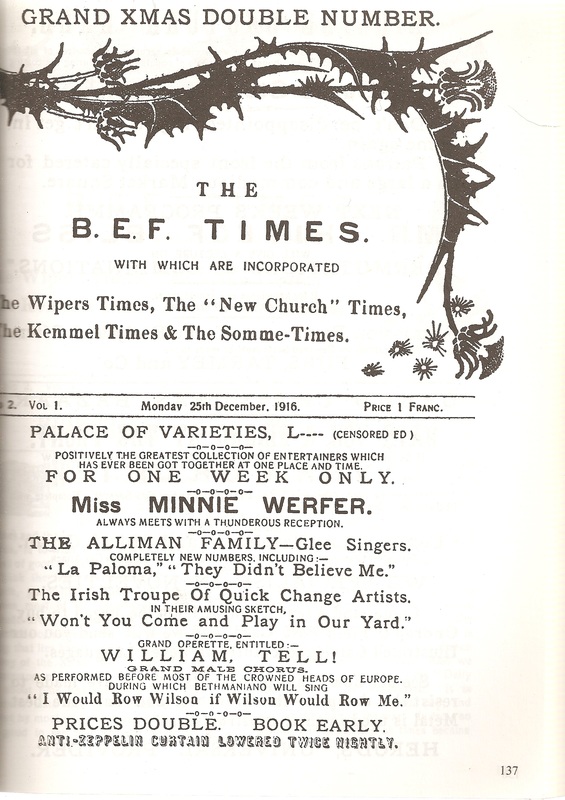 I’ve written elsewhere about the paper’s tone and contents, but I’ve occasionally wondered where its makers got the idea for its chaotic and bitty format of jokes, mock adverts and silly serials. The excellent Madame Eulalie website reprints the early work of P. G. Wodehouse, and recently the literary archaeologists there have drawn attention to an obscure item, the Globe By The Way Book A Literary Quick-Lunch for People Who Have Only Got Five Minutes to Spare (1908). 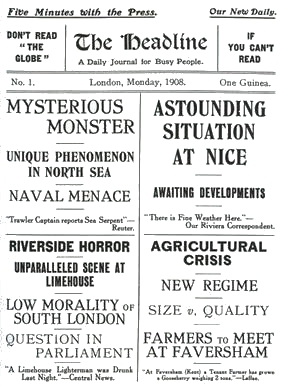 The Globe was a London evening newspaper, and ‘By the Way’ was its front-page humour column, which Wodehouse was in charge of between 1904 and 1910. 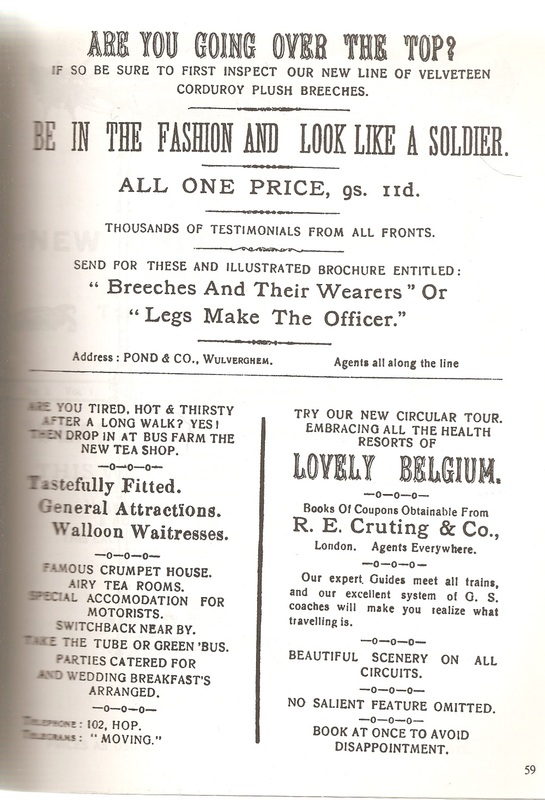 Its spin-off, The By The Way Book (written mostly by Wodehouse) was an addition, as John Dawson explains on the Madame Eulalie site, to a genre of comic books on sale at railway stations, containing jokes, cartoons, parodies and spoofs. A scene of indescribable confusion followed. The waves, which had started mountain high, were now mounting higher. The white foam hissed through the air like molten snow. The ship rocked from side to side, her every timber creaking. All the sails had gone, and the bowsprit was wobbling. The keel had long since melted before the fury of the elements. * A leak had sprung in the fore-part of the vessel, and only the promptitude of a member of the crew in shoving his cap into the hole had saved the Sir William Treloar and her precious freight from destruction. “Saved! Saved!” The glad cry was on every lip. A terrific explosion shook the vessel from stem to stern. The water had reached the powder-magazine. The night was perfectly peaceful – the leaves were falling off the trees with a soft whirr – the late autumn moon was sinking to rest – and all nature was sleeping to rehabilitate itself to bear the stress of the coming winter. But hark! What is this noise, heard at first faintly, but then with ever increasing clearness until with one terrific blast which rent the heavens and struck terror into the hearts of all our characters. Frantically major Vere de Brett reached for his gas-helmet shrieking the time “Heavens! ’tis gas!” All the characters of this powerful serial followed his example, but alas! it was too late. the cloud rolled on with ever-increasing velocity, and one by one they were engulfed in the poisonous atmosphere which had been released by an unscrupulous and dishonorable foe. So we must leave them, with their bleaching features towards the heavens, and with Vera clasped tightly in the fast-stiffening arms of Arthur. This entry was written by George Simmers and posted on September 4, 2013 at 11:40 pm and filed under History, Magazines, Military, parody. Bookmark the permalink. Follow any comments here with the RSS feed for this post. Post a comment or leave a trackback: Trackback URL. Oh marvellous. I wrote a piece about Wodehouse on the weekend, inspired by reading a recent volume of collected WIPERS TIMES. I should have looked to your blog first of course – I see you’ve been here before me. Excellent stuff! I shall share this with the folks at Plumtopia also. In my earlier piece, ‘Suffering from Cheerfulness’, I suggested that Wodehouse’s infamous radio broadcasts should be considered as part of the wider tradition of British humour in the face of adversity, and particularly at war. My inspiration for this idea was reading a volume of pieces from The Wipers Times. I’ve since discovered this piece from the excellent blog ‘Great War Fiction’, which looks at the possible influence of Wodehouse on the Wipers Times.